Grey, Black, Carling, Pigeon Peas and "Burning the Witch"
I was lucky enough to attend The Oxford Food Symposium in 2006, where I had a very interesting conversation with Ken Albala about peas. I don’t normally have conversations about peas (and I suspect that neither does Ken), however, these where rather unique and special peas so exceptions have to be made. We were talking about parching peas also known as black peas, grey peas, maple peas, carlings or pigeon peas. These are a type of dried pea that was/is eaten in the North of England and depending on the location it can be an every day dish, a festive dish, a Lenten dish or a pub snack. What interested me at the time is that pigeon peas (Cajanus cajan) are actually a tropical crop so these peas would have to be imported, which seemed like an awful lot of bother, considering many types of peas are actually grown in the UK. Though a rather complicated set of circumstances I happened to have some of these peas on me, when I showed them to Ken he was able to inform me that they were definitely not pigeon peas, but a form of field pea (Pisum sativum var. arvense). This was somewhat of a surprise as pretty much every source gives the species name as C. cajan. I knew that the peas I had where what was usually used to make parched peas, as they were sold as “Peas for Parching” and Lancastrian friends of mine had solemnly confirmed their identity. Luckily another person at the symposium was Laura Mason who is an expert of regional and historical British foods. After talking to Laura she was able to confirm that black peas/parching peas where definitely known as pigeon peas. 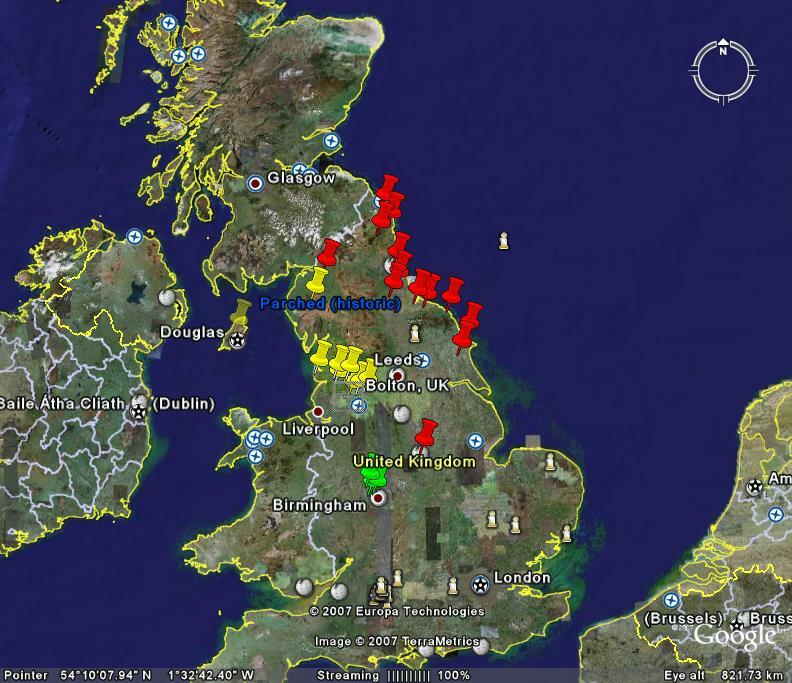 So if not quite a mystery, there was definitely something very confusing about the peas up North. It is at the point that I decided to do some serious pea research to get to the bottom of it all, this is what I was able to find out. The peas that I had in my possession where Maple peas, which are as Ken suggested a type of field pea (Pisum sativum var. arvense) and are grown in many locatons around the world. They are also commonly known as “pigeon peas”, not because they are the same species as the tropical pea C. cajan but because they are commonly used as pigeon food in the UK. 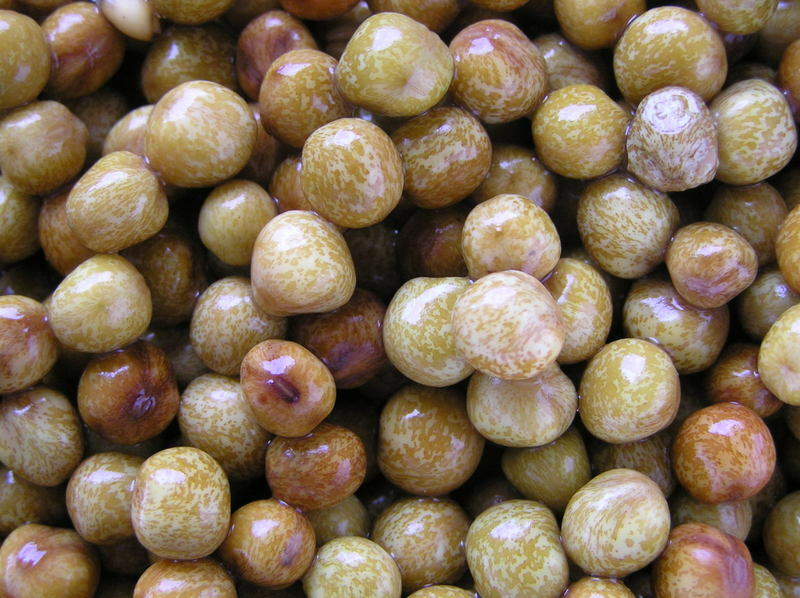 It seems that food grade pigeon peas are hard to come by, and the vast majority of these peas are raised (not unexpectedly) specifically for pigeon feed, so many people actually buy their Maple peas from livestock food suppliers. The irony is now is that it is relatively easy to obtain one type of tropical pigeon pea, C. cajan, sold as “Gungo” peas (this is a variation on “Congo” and many similar names for the same pea exist). These are sold in most major supermarkets in the ‘Jamaican’ food section and are medium sized ovoid pulse of a grey-brown in colour, so for this reason I have no doubt that they are used in some of the traditional British dishes, such as parched peas by mistake. I would imagine that the work-houses and infirmaries where not being supplied with “the choice sorts” of fresh green peas and if you take into account he relative late introduction of the potato, as a staple food idem you can being to imagine that the quantities being consumed in the Britain where “immense” indeed. Understandably, due to the importance of peas as both human and livestock fodder, there was a great proliferation in the numbers of varieties developed, with new strains often being named after the region were they where bred or where they where commonly grown. One such variety is the Rouncival pea which was developed in the 15th century at the Hospital gardens of St. Mary of Roncesvalles in Charing Cross. The importance of the Rouncival peas to the present discussion is that by the end of the 17th century John Wolridge’s Systema Horti-culturaeis is listing the types of Rouncival peas as “grey, green, blew, white and Maple”. So originally, the Maple pea seems to be grown as a garden pea, but as new improved varieties where developed it became less popular and made the transition to the field. One pea variety that may have replaced the Maple as a garden pea was the Marrowfat, which was developed in the 18th century and remains the favored dry pea in most of Britain, especially for the iconic dish of “Mushy peas”. Indeed, one reason very regional consumption of pigeon peas, maybe due to their exclusion from the dried pea niche in some areas such as Yorkshire, Nottinghamshire, Derbyshire and Lincolnshire due to the popularity of marrowfat peas in the form of mushy peas. So it seems that the Maple pea has quietly been growing in the field since as an important pulse crop, with new varieties being continually developed until the present time. So why are people still consuming Maple peas when improved varieties have existed for several centuries? Based on the 2006 production levels for peas in the UK, it wasn’t because they where readily avaible, as the level of production was 2,000, 35,000, 10,000 and 105,000 tonnes respectively for Maple, Marrowfat, Yellow and Green peas. As far as peas are concerned Maples are relatively rare (and grown almost entirely for pigeon feed), so there be other factors involved. Three main types of dried pea are eaten in the UK, split yellow, marrowfat and Maples, each of the has different cooking properties and texture and flavour. As such they are used in different types of dishes. Unlike the former two types of dried pea, Maples do not tend to disintegrate even after quite prolonged cooking, in part to the thick skin that they retain. As such the range of dishes that they are utilized in has several unique preparations, which are not possible with the other varieties. On caveat is that historically, numerous types of "grey peas" are described, Maples being only one variety. As Maple peas are the only survivor into modern times obviously they will be used for all the dishes described below, but historically it is likely that a range of "grey" peas types were consumed. In the Midlands Black Country grey peas are consumed as “Grey Paze un baircun” (grey peas and bacon). The peas are soaked overnight and cooked with brown onions until soft. Depending on the cut, browned bacon is either added to the peas as they cook or stirred through at the end. Seasonings are salt and pepper. “Parched peas”, often called “Black Peas” are confined to Lancashire, especially the region local to Preston and Bolton. There are many variations on the basic theme. -peas a soaked over night and boiled until soft, salt and vinegar added to taste. -cooked as directed above, when softened place in a single layer in the oven and baked until they swell and burst and seasoned with salt and butter. While former method is not technically “parching” the peas, it seems much more representative then the latter. According to Peter Brears, in some instances very soft peas sold at fairs and markets was described as “gutter-slush”, due to the appearance of the mixture once the vinegar was added. Carlings (also known as Carlins) where historically eaten from in the North-East of England, from the North Riding of Yorkshire to the Scottish Borders on the fifth Sunday in Lent. There are many variations in how the peas where prepared. -peas soaked overnight, boiled until soft, salt and vinegar added to taste. -cooked as directed above and parched, either in the oven or in a open vessel on a heat source. -parched as described above and seasoned with brown sugar, butter and rum. -boiled as described above, then fried in butter or drippings. 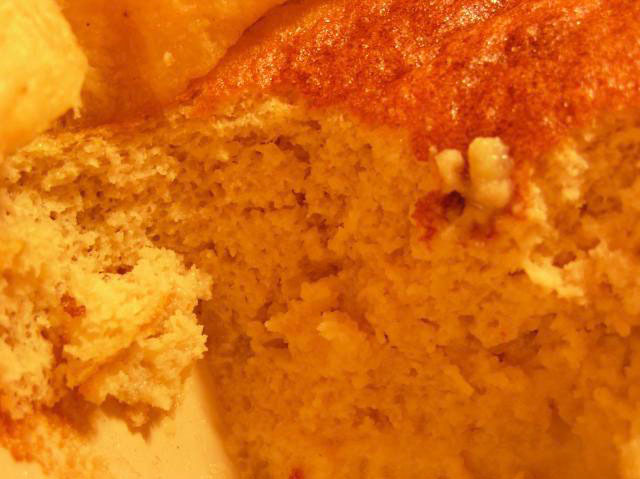 -boiled until soft, mixed with breadcrumbs, onions and formed into small cakes or pancakes which where then fried. "As Tammie glowr'd, amaz'd, and curious, The mirth and fun grew fast and furious; The piper loud and louder blew; The dancers quick and quicker flew; They reel'd, they set, they cross'd, they cleekit, Till ilka carlin swat and reekit, And coost her duddies to the wark, And linket at it her sark!" Clearly it would be of great interest to prove a link between consumption of parched peas on the 5th of November, “Carling” peas and the Northern dialect use “Carlin” as an old mysterious woman, connected with pagan fertility worship on the 1st of November. One possible scenario is that the pagan festival was incorporated into the Christian tradition of consuming pulses in Lent in the North East, but retained as a folk tradition as a festive food for around the beginning of November. At the present time the links are far too tenuous to say anything definitive. One thing of interest to note is that in some parts of the North East Carlin peas are also known as “Little Godmothers”, which is suggestive of a connection. Acknowledgment: I would like to thank Ken Albala for pointing me in the right direction, Caroline Boileau for her help and suggestions on this article. I would also like to thank Laura Mason for the very large amount of advise and discussion that she offered on this topic. Their insights sent me in directions of research that simply would not have occured to me alone. p.s. Since writing this article I have come across some additional information of interest. Several early 19th century sources mention the practice of "Burning the witch" (as described above), in areas where peas were grown (North Riding of Yorkshire for instance) the last few sheaths of pea plants were collected into a pile (or sometimes formed into an plaited into an effigy) and burnt, the parched peas were eaten with plenty of ale. At this period the practice seems to be a friendly rustic celebration, rather then a serious worship of pagan fertility goddess. However, as the name of the witch in "Burning the Witch" is the "Carling" it doesn't take a great leap of imagination to see how the peas eaten at this harvest festival would be known as "carlings". The practice of eating parched peas for the modern bonfire night seems to be a pretty straight forward transference from the harvest tradition. How the name of the peas eaten for this harvest festival was transfered to the lenten Care Sunday is less clear. On possiblity is that it similarity in the name of "carling" and "Care Sunday", coupled with the appropriate nature of eating peas during Lent, lead to this name being transfered to the Lenten celebration, while parched peas remained more generally associated with Bonfire night. Laura Mason was able to tell me that even at this late date, the "Booths" chain of supermarkets, who retails Maple peas for parching, sells most of these peas around Bonfire Night. In the case of "Carling" peas, while it may not be possible to demonstrate a direct transferance of the name from the Harvest to the Lenten period, clearly there was some level of association between the two in the minds of people that actually participated in the ritual eating of these peas and it does go a long way to explain why the use of these field peas, rather then improved modern strains has been retained. The next quote is a good example of the association of the Carling "witch" with the peas of Care Sunday. Gy-carling, a sort of mischievous elf; It was formerly a common instruction, on the Borders that on Carling Sunday a person must eat carlings till he was so full that the gy-carling could not get a “grip of his waim”. One of the great pleasures in cooking from historical sources is in unexpectedly finding a recipe that is so delicious that it can be added to the restricted and somewhat repetitive range that tend to form the domestic pantheon of food that is cooked on a daily basis. The truth is that for all the hundreds of cookbooks I have read and the thousands of recipes that I have considered, in reality I still cook a core of about 30 dishes on a regular basis. I suspect that this behavior is common to most people. The following recipe comes from a very tatty and unbound book that I was lucky enough to come across in a junk store. 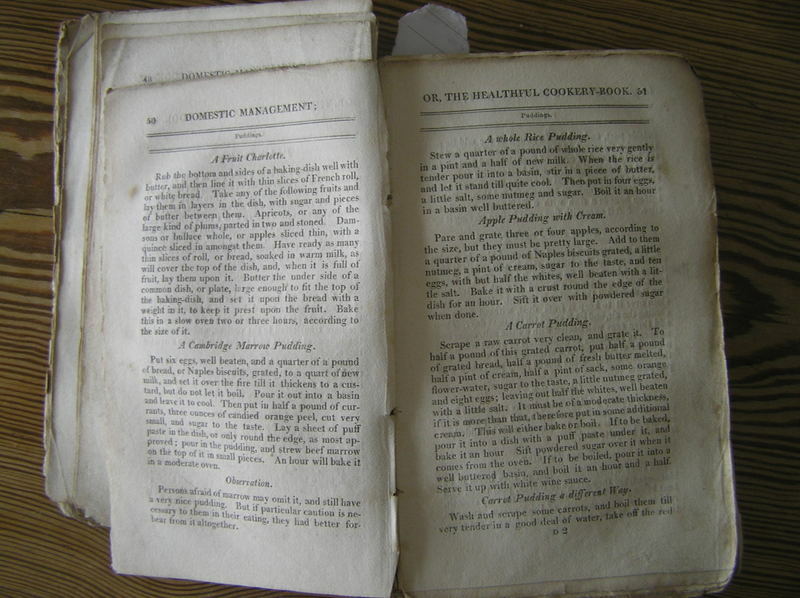 Published anonymously in 1813 as “Domestic Management; or, the Healthful Cookery-Book” by “A Lady”, it is fairly typical for the period, a mix of domestic advise, cookery and stern moral instruction. More unusually though, although many of the recipes are obviously copied from other sources (as is also rather typical in this period), the choice of recipes is obviously very personal. A recipe for a 17th century Whitepot rubs shoulders with the very new fruit “Charlotte”, the list of garden vegetables and herbs look very modern and is copied from a French source, while the very British meat pie and pudding section contains medieval sweet meat pies that had all but disappeared from mainstream cookbooks during the previous 150 years. Pare and grate three or four apples according to the size, but they must be pretty large. Add to them a quarter of a pound of Naples biscuits grated, a little nutmeg, a pint of cream, sugar to taste, and ten eggs, with but half the whites, well beaten with a little salt. Bake it with a crust round the edge of the dish for an hour. Sift it over with powdered sugar when done. This type of English pudding is more similar to a tart then the archetypal British boiled suet pudding. They became extremely popular during the 18th century and form the basis of many similar desserts. In texture they are quite cake like although rather moist. 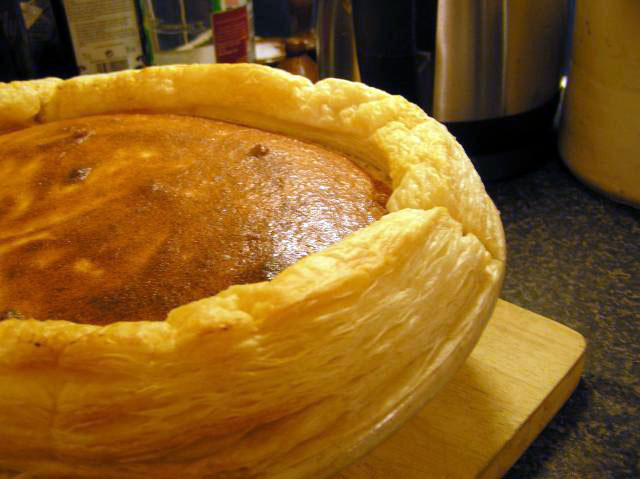 Often referred to as “Pudding Pies”, perhaps the most famous extant example is known as a “Kentish Pudding Pie”. The direction to line the edge of the pie dish with pastry may seem rather odd, but there is a very practical reason for it. 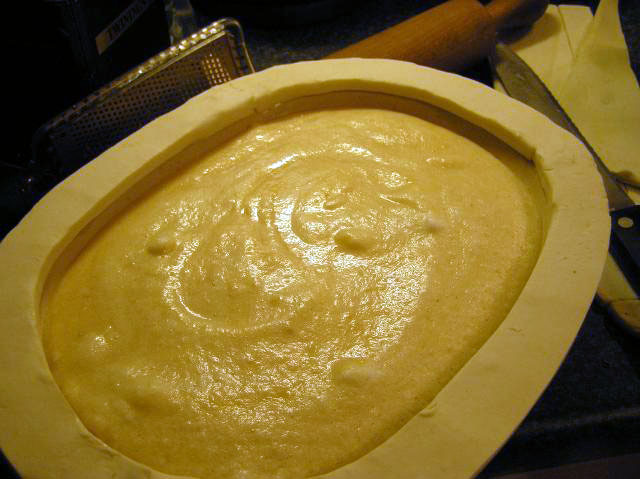 Due to the folding in of beaten egg whites, the mixture raises dramatically in the oven. The edging of puff pastry (puff pastry was commonly used to line and edge pies and tarts in this period) also rises during the baking and prevents the filling from spilling over the side of the dish. Naples biscuits, also know as Savoy/ Savoiardi or sponge fingers are also commonly used as a base in similar recipes (although they now are more commonly used in trifles or tiramisu rather then baked recipes). The variety of apple I used here is a Bramley’s [seedling], perhaps the most popular cooking apple in the UK, being rather tart and readily cooking to a pulp. However, I suspect that a mix of these and the more aromatic Gravenstein would be even better.